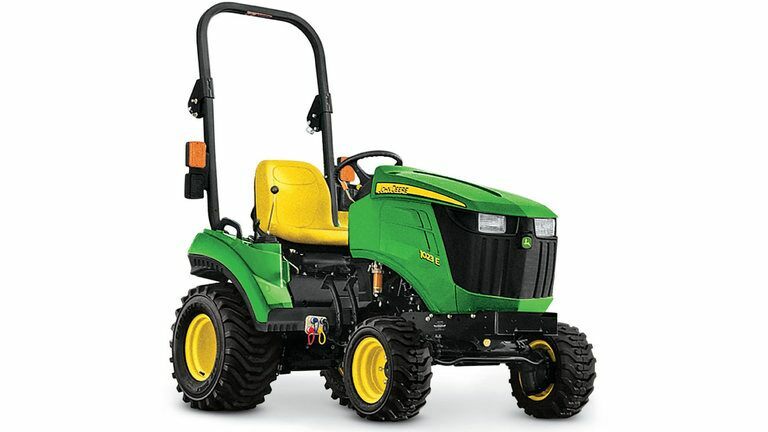 Discover the most efficient compact utility tractor available: the John Deere 1023E. This conveniently small tractor, available for sale in Central Virginia, digs into your chores, not your wallet. More capable than a standard tractor, the 1023E is equipped with the strongest foothold in the industry for stability. The stamped-steel deck incorporates intuitive controls and an integrated independent lift. With 23 available John Deere and Frontier implements, ranging from loaders to backhoes, you can work your land with time to spare. And, with its iMatch Quick-Hitch compatible implements, attaching implements has never been quicker or easier. With the cutting edge engineering of the 1023E, you'll find the results of customer feedback combined with over 175 years of experience. Discover incomparable stability, ease of use, and comfort. Virginia Tractor has everything you need for your field, home, or operation. No matter your chore list or your equipment, we can assist. If you’re unclear which tractor will best suit what you need, visit one of our 6 Virginia Tractor locations today for a test drive, or give us a call at 888-782-8005. We’d love for you to be a part of the Virginia Tractor customer family!